Today's pattern is the Command, which allows the requester of a particular action to be decoupled from the object that performs the action. Where the Chain of Responsibility pattern forwarded requests along a chain, the Command pattern forwards the request to a specific module. One example of the command pattern being executed in the real world is the idea of a table order at a restaurant: the waiter takes the order, which is a command from the customer.This order is then queued for the kitchen staff. The waiter tells the chef that the a new order has come in, and the chef has enough information to cook the meal. So what does this mean in a class diagram? Command declares an interface for all commands, providing a simple execute() method which asks the Receiver of the command to carry out an operation. The Receiver has the knowledge of what to do to carry out the request. The Invoker holds a command and can get the Command to execute a request by calling the execute method. 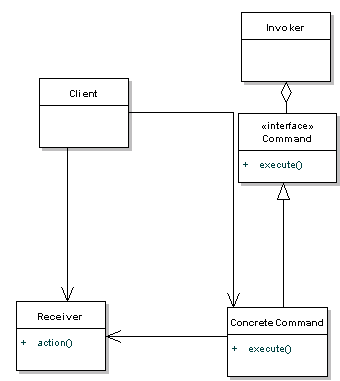 The Client creates ConcreteCommands and sets a Receiver for the command. The ConcreteCommand defines a binding between the action and the receiver. When the Invoker calls execute the ConcreteCommand will run one or more actions on the Receiver. If this all seems a bit confusing right now, hang on for the code example later on in the article. You'll see command being used a lot when you need to have multiple undo operations, where a stack of the recently executed commands are maintained. To implement the undo, all you need to do is get the last Command in the stack and execute it's undo() method. You'll also find Command useful for wizards, progress bars, GUI buttons and menu actions, and other transactional behaviour. Let's use a remote control as the example. Our remote is the center of home automation and can control everything. We'll just use a light as an example, that we can switch on or off, but we could add many more commands. Our invoker in this case is the remote control. This pattern ends up forcing a lot of Command classes that will make your design look cluttered - more operations being made possible leads to more command classes. Intelligence required of which Command to use and when leads to possible maintainence issues for the central controller. We're going to look at the Template pattern early next week.